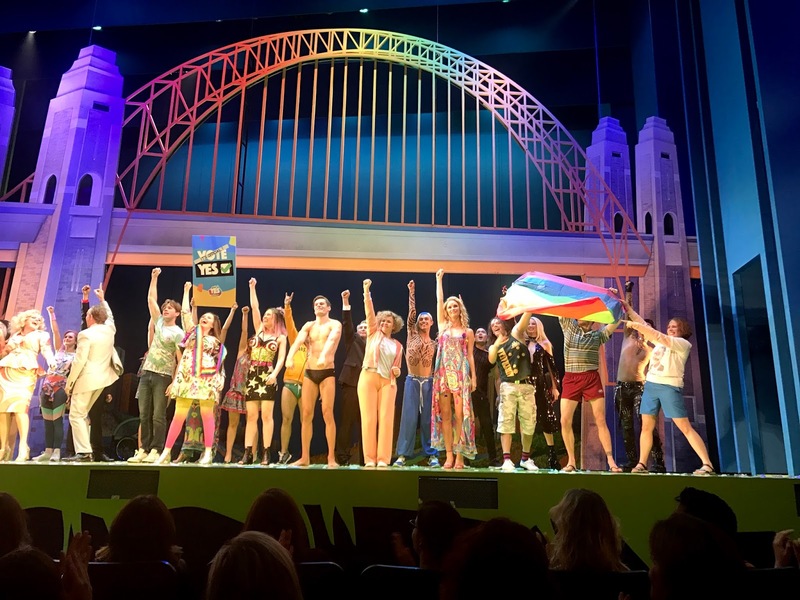 By chance, we went to Muriel's Wedding, The Musical, Sydney Theatre Company, on the night the marriage equality legislation finally passed. A tortuous and disgustingly politicised process had at last come to its proper conclusion. I'd bought the tickets more than a year ago for K's birthday. Driving through the city in heavy traffic on the way to the theatre, we heard the final moments, and then the cheering, crescendoing into We Are One from the visitor's gallery. it was emotional, but also a strange feeling which I struggle to define. The best I can come up with is perhaps it's like being let out of jail after decades kept in the dark - the light is too bright. It's a terrific show, and tracks the film very closely. Maggie McKenna (she's Gina Riley's daughter - Kath and Kim, The Games) stands out from a stand out cast, with perhaps Gary Sweet just missing the sleaze needed for the sleaze bag father, he's just, mmm, too sweet. (booom tish). It's a bit too long, and easy to trim, and the ending needs a bit of a rethink maybe, but no matter really. The ghosting presence of ABBA is genius. And so, in the curtain calls, this fabulous cast took on the spirit of the night. That's Maggie McKenna (Muriel) holding the Vote Yes placard.